The tool used to deposit and non-destructively characterize 2D MoS2, which forms the basis of the quality control process. Next generation electronics will be smaller, faster and more efficient – but only if materials can keep up. Silicon is reaching its physical limits, so interest is turning to new alternatives. Two-dimensional materials possess diverse properties that make them an attractive option. One such material, the semiconductor MoS2, is proving a promising candidate for electronics and optoelectronics. But to commercialize these novel materials on an industrial-scale, manufacturers must produce quality-controlled layers just a single atom thick. How can producers carry out quality control checks on such thin layers of material without causing catastrophic damage? A joint effort by the National Physical Laboratory (NPL) and Oxford Instruments, technology systems and tools provider for industry and academia, may have come up with the answer. 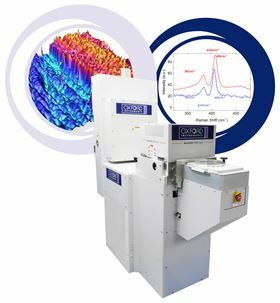 Building on NPL’s expertise in characterization of that ultimate 2D material graphene, Oxford Instruments has developed a quality control procedure that uses Raman spectroscopy to quantify the defects in MoS2 non-destructively. Previously, there had been no standard way of checking the quality of MoS2 layers without destroying them. But, by introducing nanoscale defects into 2D layers of MoS2 in a precisely controlled manner, NPL’s research revealed that inelastic scattering processes contribute to the appearance of defect-activated Raman peaks. In fact, the peaks in Raman spectra can be correlated quantitatively with the level of disorder in the MoS2 layer, leading to a precise determination of the level of defects in the material. “We were able to use NPL’s research as a framework for developing our own quality control measure that uses Raman spectroscopy to quantify defects in MoS2 produced using chemical vapor deposition,” says Ravi Sundaram, senior scientist at Oxford Instruments. The company has now developed a large-area chemical vapor deposition and atomic layer etching tool for producing 2D MoS2. The team used the newfound means of assessing the presence of defects to determine the effects of different processing conditions, such as pressure and substrate surface. For industrial producers, this means that technicians will be able to identify high-quality MoS2 layers quickly and easily, enabling optimization of deposition and etching processes. Piezoelectric components can now be directly integrated onto silicon chips.